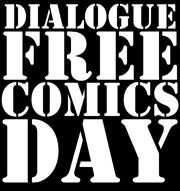 Today, May 14th, is ‘Dialogue Free Comics Day.’ It’s a challenge to create a silent comic, a mute comic, a comic where actions speak rather than words. Talking heads can take a hike. Show – Don’t tell! Text, in the form of signs or sound effects are allowed however. Conceived by Noel Curry of D. J. Bogtrotter to reaffirm comics as a primarily visual artform forty other webcomics decided to participate. I think it’s a great idea! It’s easy to fall into the trap of explaining the story through dialogue rather than trusting the images. The pictures in a comic need to be important otherwise they’re superfluous. Creating a silent page is a great exercise. They say a picture paints a thousand words which makes them capable of greater impact. Some jokes are purely visual – they’re simply not funny in the telling. And of course silence breaks all language barriers.